When you’re both off and on duty, this coat will ensure you look smart yet relaxed. 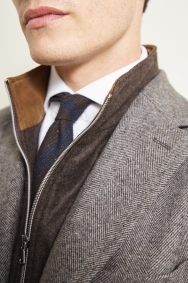 In a herringbone weave, this coat has a classic look that works over any outfit. 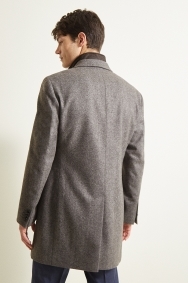 The material is woven in Italy where fine fabrics are renowned, ensuring the coat has a timeless and polished appearance. Featuring a zipped insert, it creates a relaxed layered style while helping to keep you warm. 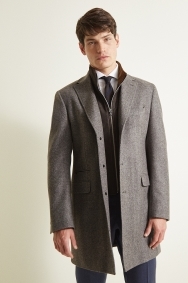 Wear this coat over any outfit, whether you’re in your suit or simply trousers and a shirt. Create a bold silhouette with a high quality coat in a regular fit. The relaxed cut is highly versatile and looks sharp worn open or buttoned up. 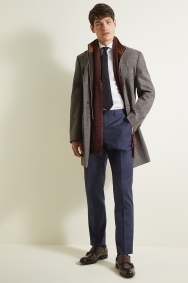 Whether you’re in a smart suit or laid back leisurewear, a regular fit coat pulls your outfit together in an instant. The extra space around the shoulders and back delivers all-day comfort and plenty of freedom to move.